Winter’s here in full force! And alongside some tasty holiday treats comes plenty of snowfall and ice-covered roads for your commute. Is your car ready? After all, you’ll want to ensure that your drives are not only easy this season, but safe as well. So, here are some quick and easy tips for winterizing your car. If you’re wondering how to prepare your car for winter, your tires are hands-down the best place to start. Really, it’s hard to go wrong with winter tires during these cold months. Seriously, these wheels are perfect for gripping to any snow and ice-filled road. Plus, they’re even capable of reducing your braking distance by 25% in winter conditions on average. Can you ask for more when it comes to those emergency stops on ice? You’ll probably see all-season tires as an option as well. But up here in Yarmouth, they simply won’t cut it for these winter conditions. Instead, save the all-season tires for when the weather warms up and get yourself a set of winter tires for the next few months. Also, don’t forget to keep a close eye on your tires’ psi. After all, air contracts in the cold. This means your tire pressure will drop quickly in the winter. So, it goes without saying that you’ll want to check (and top off) your tire pressure frequently for these colder months. Winter can be a harsh season for your battery. In fact, just think of all the extra features that go into use when the cold weather hits. You’ve got your heater, wipers, defroster, lights, and radio going more often than normal. And if you ever forget to shut any of these electronic features off when you leave your car, your battery suffers quite a bit. So, make sure it’s topped off so that you don’t get stranded on the side of the cold road from your battery going out. Also, try to keep the terminals clean and check for any corrosion. This will ultimately aid in preserving your car battery’s life during the winter. In general, this is great car maintenance practice. In fact, it’s the fastest way to find any small issues before they develop into huge (and costly) problems. Start by checking your belts and hoses. If you see any tears or issues, you’ll want to get that looked at. Also, make sure all your car’s basic functions are working properly, like your brakes, windshield wipers, and lights. And lastly, check the underside of your car. Specifically, look for any loose panels or parts. If anything seems out of place, you’ll want to get that fixed. Otherwise, you can expect some huge problems if you hit an unexpected snow bank or curb when driving down the road this winter. With winter in full effect, you’ll want your car prepared for the cold season as soon as possible. So, schedule a service appointment at Yarmouth Mazda for all your winter car service needs. 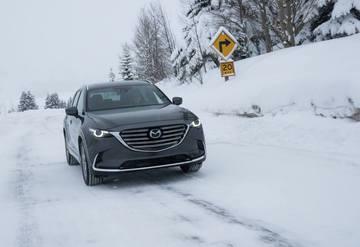 After all, nothing beats safety and efficiency on these icy roads.